Containment Protocols: All RPC-016 instances, save for RPC-016-5, are to be stored in Alpha Storage Locker 30 at Site-002. Direct contact with instances of RPC-016 is not to be made outside of testing, and not without the express permission of the Lead Researcher. RPC-016-5 is to be contained within standard humanoid living quarters, fed three times daily, and provided items requested pending approval by the Lead Researcher. For a full list of items requested, see addendum "RPC-016-C". 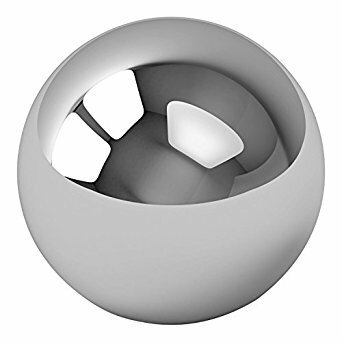 Description: RPC-016 is a set of five large grey balls, numbered RPC-016-1 through RPC-016-5, each with a diameter of approximately 15 centimeters, and a weight of 27.20 kg, consistent in density, weight, and atomic composition with 1060 steel (0.60% carbon, otherwise pure iron). Upon making direct skin contact with a human hand, instances of RPC-016 will absorb into the body of the subject, and begin the process of replacing their skeletal structure with itself. RPC-016-5 is currently held by a young, blonde, white female, age ██, recovered along with RPC-016. This process is slow, with the current record belonging to the subject bonded to RPC-016-5, with 50% replacement over the course of four years, and growing. Subjects report no pain throughout this process, and show no signs of trouble moving despite the extra weight. Additionally, subjects bonded with an instance of RPC-016 display the ability to pull portions of the object from themselves, and mold it into various shapes. The process of pulling portions of RPC-016 from the body creates 1 cm long cuts in the palm of the dominant hand, which reportedly causes no pain, and heals at four times the standard human regeneration rate. This regeneration does not extend to any other wounds. To date, all shapes created by RPC-016 have been in the form of weapons. The cause of this restriction is currently unknown. For more information on weapons formed by RPC-016, and the test logs of their effectiveness, see Addendum RPC-016-A. Procedure: Subject will make direct skin contact with RPC-016-1. Results: RPC-016-1 was absorbed into the body of the Subject. Subject reported no pain from this process, despite a 1 cm long cut being visible in his palm. Cut healed in 10 seconds. Subject reported a "weird gooey feeling" in the palm of his dominant hand, and swiftly demonstrated the same abilities as RPC-016-5, attempting a breach. Subject terminated. RPC-016-1 formed in palm of Subject's dominant hand exactly 30 seconds following death. Doctor A███████ Notes: Subjects that come into contact with RPC-016 seem to gain an intuitive knowledge of it's properties and how to use them, but do not gain any sort of skill with weapons manifested. Testing involving CSD-Class subjects is to be continued with increased security. Procedure: Subject will make direct skin contact with RPC-016-1 after being informed that attempting a breach will result in termination. Subject will be instructed to attempt to form a sword, a crossbow, and a handgun, in sequence. Results: Subject experienced sensations similar to CSD-0461 upon making contact with RPC-016-1. Subject also demonstrated knowledge of RPC-016's functionality. Upon request, Subject created all three items in sequence, and when provided with suitable targets, was able to use them as effectively as an average civilian untrained in combat. Testing showed that RPC-016 creates it's own ammo, and regenerates itself from an unknown reserve. When testing RPC-016 in crossbow form, Subject demonstrated the ability to pull back the drawstring without touching it, making it appear as if RPC-016 could reload itself. Subject claimed this was due to RPC-016 granting limited telekinetic ability. RPC-016-1 appeared to be extracted willingly by Subject, but during transport, Subject attempted a breach, showing the capacity to control RPC-016-1 without any contact. Subject terminated. Doctor A███████ Notes: Following this incident, CSD-Class are no longer to be used in testing. If RPC-016-5 is uncooperative, a volunteer from among research staff will become a permanent test subject instead. Research cannot continue when each test comes with an attempted breach. Next tests should focus on the telekinetic ability, and where RPC-016 gets additional material for the creation of ammunition. Procedure: RPC-016-5 will be requested to form a rifle of it's choosing, and fire it until unable to continue. RPC-016-5 will attempt to attempt to fire said rifle without touching it. Results: RPC-016-5 showed no hesitation in following instructions, and understood what was requested without needing additional information. Subject displayed that ammunition generated by RPC-016 generates in an infinite or near infinite supply, as testing was stopped after six hours of continuous fire. Subject displayed remarkable accuracy for a human of comparable age, and remarked that it had experience. RPC-016-5 also appeared to be fully capable of operating it's weapon from a distance of up to 10 meters away, and after additional testing procedures were invented on the spot, was capable of multitasking, producing two separate rifles of identical model and firing both at separate targets, though accuracy was shown to fall. RPC-016-5 claimed that this was it's limit at the moment, but that RPC-016 can "grow" the longer it is bonded with a human, and given time, she might be capable of producing three or more weapons at once. Doctor A███████ Notes: RPC-016-5 is surprisingly cooperative and shows an extensive knowledge of the inner workings of RPC-016 instances. Reminder to all staff that RPC-016-5 is still dangerous, and to exercise caution around it. Should RPC-016-5 attempt a containment breach, it is to be terminated. Telekinetic ability of RPC-016 is far beyond originally thought. The methods of it's generation are still a mystery, and may remain that way. Next test to explore the limits of RPC-016's shapeshifting abilities. Results: RPC-016-5 seems unable to create objects that are not weapons, but within the category of "weapon", it's capabilities are apparently unlimited. Failed objects include: kite shield, yo-yo, car keys, book, spoon, boot, helmet, and others. Doctor A███████ Notes: RPC-016 cannot create objects to defend itself unless those objects have offensive capacity. RPC-016-5 displayed distress when unable to create an object, this will be examined in further detail in the interview scheduled in place of next test. Testing temporarily suspended. RPC-016 was first discovered on 22/06/██, in the town of [REDACTED], Wisconsin, after a local hospital contacted the Authority, citing a young female with roughly a quarter of her skeleton replaced with a metal of unknown make and origin. Further investigations led Mobile Strike Force 015 to the home of [REDACTED], where RPC-016 was discovered in it's bonded state, with one instance for each member of the family living in the home, including the child reported to the Authority. The father of the family, alongside his three sons, attempted to fight back against MST-Foxtrot-015, and were killed. A stray bullet struck the youngest family member in the thigh, revealing that RPC-016 had indeed replaced her femur with metal. The girl was taken into custody, and assigned the designation RPC-016-5, with the four objects recovered from the family designated RPC-016-1 through RPC-016-4. During investigations, the father's computer was discovered to contain notes that state he created RPC-016 via unknown means, as tools for "the revolution". Details of it's creation were not mentioned, and attempts by the Authority to replicate RPC-016 have ended in failure thus far. Additional Notes: There is no reason to give the subject more than the standard nutrient-enriched stew. Additional Notes: Granted on the basis that boredom might lead to an attempted breach. Subject given a 50 dollar monthly book budget. Additional Notes: Subject cannot be allowed to contact the outside world. Additional Notes: Granted as a reward for cooperation during testing. Subject will be allowed to order food from the same menu as staff. Additional Notes: Retrieving another child of the same age as the Subject is against Authority policy.